For centuries, chemistry sets have captivated amateur scientists of all ages. The Stinks, Bangs & Booms website traces the rise and fall of the American chemistry set starting at its inception in 1791, through its subsequent heyday (1920-1960), decline (1960-1979), and recent resurgence. Working collaboratively with Philadelphia’s Chemical Heritage Foundation—and inspired by their robust research—Bluecadet conceptualized and developed an engaging online interface that chronicles the chemistry set and its colorful history. The timeline is guided by succinct slides of text, seamlessly integrated with entertaining, enlightening multimedia elements including vintage science videos, historic artwork, photographs, documents, music, and more. Influential chemists and teachers come to life through spoken audio, while subtle animations and transitions create an elegant, cinematic effect. Far from a passive educational experience, the website encourages interaction throughout: clicking an arrow to flip from screen to screen, cracking a digital egg or pulling a curtain to find answers, (safely) exploring a set’s banned chemicals, and sharing the journey via social media. After listening to personal recollections by notable scientists, users are invited to provide their own childhood memories of the chemistry set. 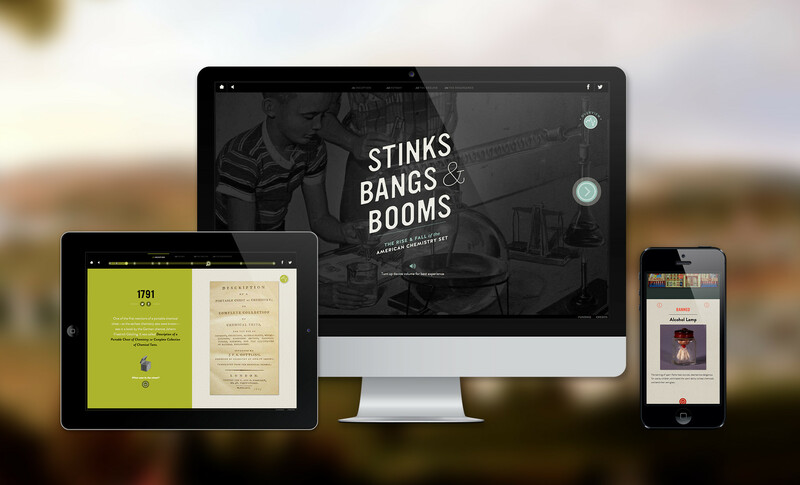 Stinks, Bangs & Booms is responsive across devices, from smartphones to computer screens. In addition to serving as a stand-alone online experience, the website is intended to enhance the Chemical Heritage Foundation’s exhibition of the same name—building advance buzz for its opening in 2015 while collecting user data.